Summary: A new study reveals the majority of V1 neurons project to higher visual areas in a non-random manner. An international collaboration of neuroscientists have today published a paper in Nature demonstrating the breadth of neural communication in visual cortex using a combination of methods for tracing the projections of individual neurons across the brain. Up until now, it had remained unclear as to whether information transfer from primary visual cortex was largely “one neuron – one target area”, or if individual neurons distributed their signals across multiple downstream areas. In the Nature paper, the team outline the two complementary methods they used to map the projection patterns. Firstly, they used whole-brain fluorescence-based axonal tracing by labelling neurons in the right visual cortex of each mouse with GFP and then imaging axonal projections by whole-brain serial two-photon tomography. The Allen Mouse Brain Reference Atlas was then used to identify the areas in which axonal terminations were observed. The mouse primary visual cortex (V1) neurons were found to have a high degree of projectional diversity and most of the individual layer 2/3 neurons were found to distribute information to multiple areas rather than projecting to a single target. Such neurons were termed ‘broadcasting neurons’. This is the diversity of single-cell projections from mouse visual cortex revealed by fluorescence-based tracing. Each panel in the background shows the traced axon of a single neuron from the upper layers of primary visual cortex. The grey outlines are the brain borders. The foreground brain contains two traced cells overlaid in different colours. NeuroscienceNews.com image is credited to Sainsbury Wellcome Centre. The researchers state that the results of the study “suggest a functional specialization of subpopulations of projection cells beyond ‘one neuron – one target area’ mapping. “The next piece of the puzzle will be to understand what each of these projection motifs does for visual processing and perception and how these long-range connectivity patterns are established during development,” Professor Mrsic-Flogel concluded. Funding: This research was supported by U.S. National Institutes of Health; Brain Research Foundation; IARPA; Simons Foundation; Paul Allen Distinguished Investigator Award; Boehringer Ingelheim Fonds; Genentech Foundation; European Research Council, and Swiss National Science Foundation. Image Source: NeuroscienceNews.com image is credited to Sainsbury Wellcome Centre. Original Research: Abstract for “The logic of single-cell projections from visual cortex” by Yunyun Han, Justus M. Kebschull, Robert A. A. Campbell, Devon Cowan, Fabia Imhof, Anthony M. Zador & Thomas D. Mrsic-Flogel in Nature. Published online March 28 2018. Sainsbury Wellcome Center “Brain Wide Tracing of Single Neurons Reveals Breadth of Information Transfer From Visual Cortex.” NeuroscienceNews. NeuroscienceNews, 28 March 2018. 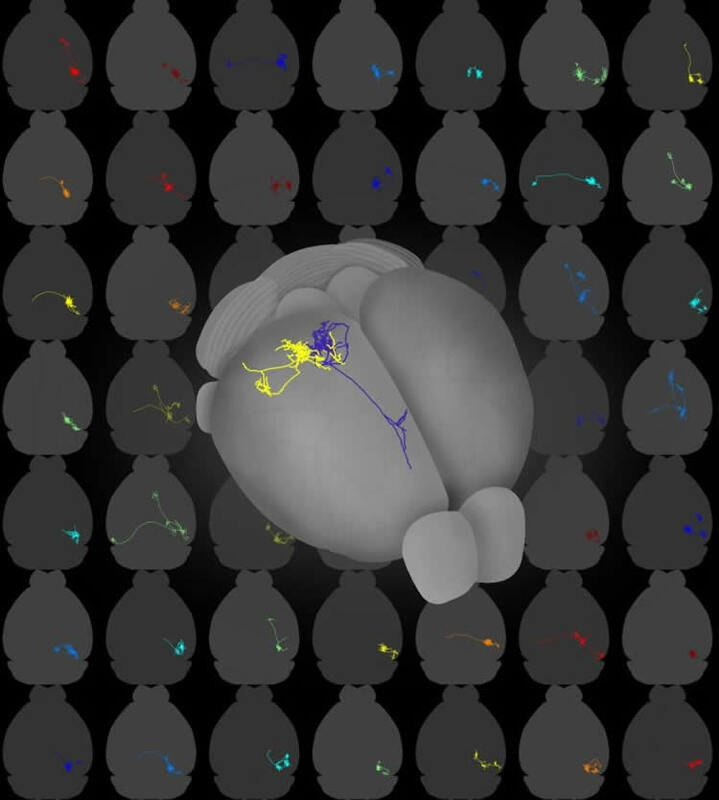 Sainsbury Wellcome Center “Brain Wide Tracing of Single Neurons Reveals Breadth of Information Transfer From Visual Cortex.” http://neurosciencenews.com/visual-cortex-neuron-tracing-8704/ (accessed March 28, 2018). Neocortical areas communicate through extensive axonal projections, but the logic of information transfer remains poorly understood, because the projections of individual neurons have not been systematically characterized. It is not known whether individual neurons send projections only to single cortical areas or distribute signals across multiple targets. Here we determine the projection patterns of 591 individual neurons in the mouse primary visual cortex using whole-brain fluorescence-based axonal tracing and high-throughput DNA sequencing of genetically barcoded neurons (MAPseq). Projections were highly diverse and divergent, collectively targeting at least 18 cortical and subcortical areas. Most neurons targeted multiple cortical areas, often in non-random combinations, suggesting that sub-classes of intracortical projection neurons exist. Our results indicate that the dominant mode of intracortical information transfer is not based on ‘one neuron–one target area’ mapping. Instead, signals carried by individual cortical neurons are shared across subsets of target areas, and thus concurrently contribute to multiple functional pathways.